USD got weakened after the imposition of tariffs on import of metals and on the other hand, despite the hawkish tone of the BOE, GBP is not showing any signs of strength as well. 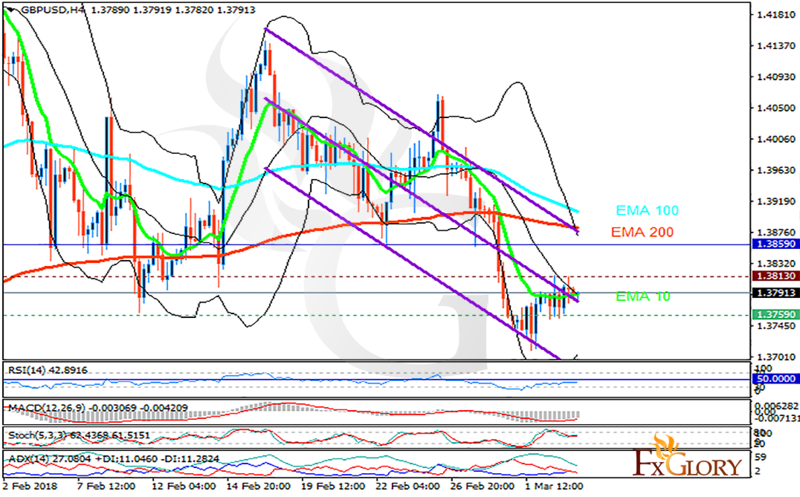 The support rests at 1.37590 with resistance at 1.38130 which both lines are below the weekly pivot point at 1.38590. The EMA of 10 is moving horizontally in the descendant channel and it is below the EMA of 100 and the EMA of 200. The RSI is moving below the 50 level, the Stochastic is moving in high ranges and the MACD indicator is in negative territory. The ADX is showing buy signal. The pair will be fluctuating within the upper and lower Bollinger bands, however, 1.388 level breakout will push the pair higher towards 1.40.